Do you know your android phone more than me? But don`t worry, I will help you to understand your phone in more better way. Today I am going to share the 600+ secret codes of android devices which will help you to understand your android phone in more better way. In this list of 600+ best hidden android secret codes of 2018, you will find codes of GPS, factory reset, Bluetooth, firmware version, wlan test, and other phone secret codes in 2018. These codes will cover all the major smartphone brands such as Samsung, HTC, Micromax, Huawei, LG etc. You may also like to know that android secret codes is one of the most popular keyword in search engines. So today I am going to share the best working android secret codes for your android devices. Be a smart android user with these android secret codes. 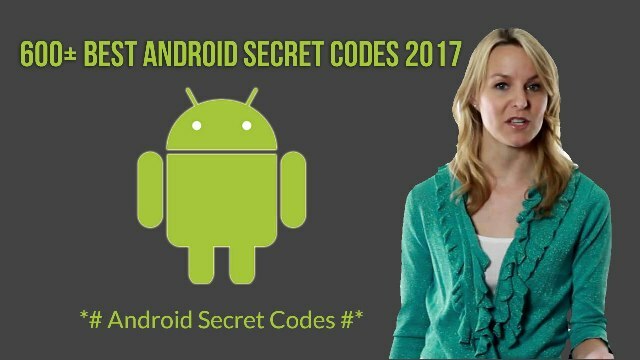 You can even use these Android secret codes to access the hidden functions of your android device. With these codes you can unlock the advanced settings. You may already know that android smartphones are dominating the smartphone industry. Android developers has created various backdoors to make changes in settings. These backdoors can be unlocked using android secret codes. What is the android Secret Codes? Android secret code is a combination of numbers and symbols to get access the secret or advanced settings of the system for various purposes. *#*#7780#*#* To Remove Google account setting. *#*#7780#*#* To Remove System, app data and settings. *2767*3855# To Reinstall the firmware. *#*#197328640#*#* To enter into Service mode. *#*#197328640#*#* To run and change in the service mode. *#*#8255#*#* To launch G Talk Service Monitor. *2767*4387264636* To display product code. *#0228# To know Battery Status. *#32489# To know Ciphering Info. *#*#232338#*#* To know WiFi MAC address. *#*#1111#*#* Display FTA SW Version. *#*#2222#*#* Display FTA Hardware Version. *#7284# USB 12C mode control. *#*#44336#*#* Display Build time changelist number. *#*#44336#*#* PDA, ChangeList number, Build Time, CSC, Phone, . *#03# NAND flash serial number. *#*#0842#*#* Vibration test and Back Light test Device test. *#0782# Real time clock test. *#*#8351#*#* To enable Voice dialing logging mode. *#*#8350#*#* to disable voice dialing logging mode. **05***# Emergency dial screeen to unlock PUK. *#301279# HSDPA HSUPA control menu. *#7465625# View phone lock status. ##7764726 Motorola DROID hidden service menu. 1809#*990# LG Optimus 2x hidden service menu. 3845#*920# Lg Optimus 3D hidden service menu. These android secret codes are verified and work really good.. I also like to tell you that alll secret android codes may not work on every single android device.You can use them and find out which are the best android secret codes for your smartphone. Android secret codes are for developer purpose, so when you are using them be sure that you know what you are doing. These codes are to boost your knowledge about what a user can do with these codes on your smartphone. IT is always good when you know which secret android code is going to be really helpful for you and help you to take backup of your data in really easy way. When using these android secret codes you may change the device completely. You should be careful while using these secret codes on your android phone. Don`t forget to share what you learn here. Which Android smartphone you are using? Do you know any other android secret codes? Feel free to hare via comments.